Yesterday at the S.E.C. meetings in Hoover, Alabama, Florida's Bull Gator let everyone know he was not over Georgia's excessive celebration in last year's GEORGIA- Florida game. Today at those same meetings, UGA's Head Dawg Mark Richt responded to the media's questions regarding "Crier Meyer's " remarks. One thing that I found particularly interesting was the fact that Richt called Meyer after the game and explained the entire episode to him. He also apologized to the Florida coach. Now, Meyer never mentioned any of that. He just sounded as if he got pooh poohed on and no one from Georgia responded. Come on Urban, tell the whole story. 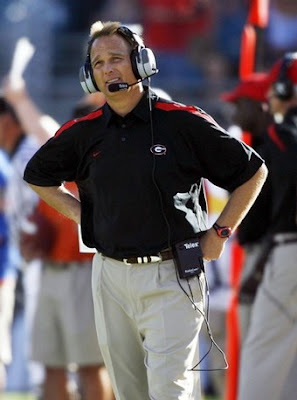 Don't act as if you just thought Coach Richt was totally irresponsible. You knew better; the man explained it to you himself. The best thing the Georgia head coach said about last year's game was that the celebration and penalties didn't put the intensity back in the border war, it was the Dawgs victory that pushed the intensity level through the roof. And that my friends is what Urban Meyer is so concerned with even though the two teams don't play for more than 90 days. He realizes that a sleeping Dawg has awakened, and that he is hungrier than ever. Remember Urban, you should always let a sleeping Dawg lie!